The Milwaukee Bucks, on the Eve of the 2012 NBA Draft, have acquired C Samuel Dalembert (6'11", 250 pounds) from the Houston Rockets, in exchange for SG Shaun Livingston, PF Jon Brockman, and PF Jon Leuer. The teams also swapped draft picks. Rockets now have the 12th pick, Bucks now have the 14th pick. The deal looks like a good one for the Bucks, who move down only two picks in the lottery and part ways with a few non-core pieces in order to acquire Dalembert, who fills a need in the middle. Dalembert's 2012/2013 contract is only partially guaranteed, but the Bucks figure to hang onto the big man and his $6.7MM salary. 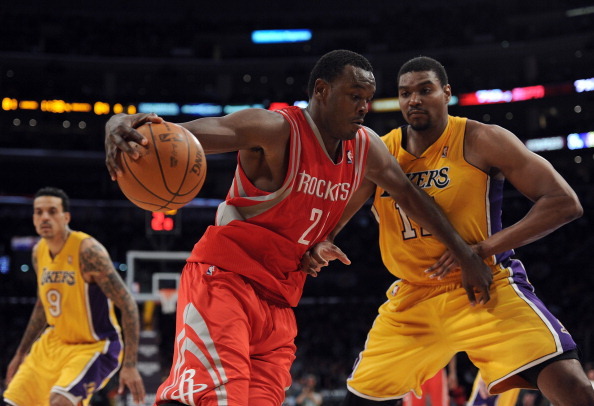 Samuel Dalembert will fill the vacant hole at center the Bucks lost when they traded Andrew Bogut to the Warriors. Terrence Jones (right) stands among the elite Kentucky team that included future #1 overall pick, Anthony Davis. 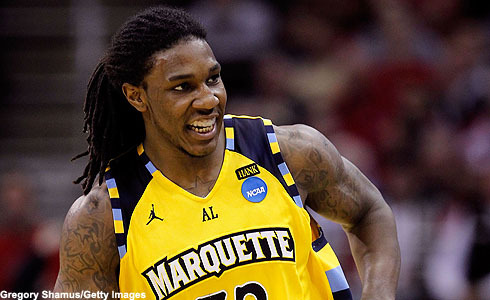 2nd Round, 42nd Overall Pick: Jae Crowder (6'6" 225 pounds) SF, Marquette - Not 100% set on Jae getting picked, however, this pick will definitely be used on a small forward or shooting guard for sure. Other options include Robbie Hummel, Darius Miller, Kevin Murphy etc. The Bucks to have caught on that drafting home grown talent is something that can pick up attendance, too. So, them drafting Jae Crowder, DJO, or Jordan Taylor shouldn't come as a surprise on Thursday. Plus, whoever is drafted won't be a starter right away. I think the Bucks are ready to get the ball rolling with Tobias Harris. A back-up is all this pick will be. Our biggest concerns were taken care of with the trade made, and our 1st round pick will do the same. Crowder, who is used to playing on the BMO Harris Bradley Center court, would feel right at home with the Bucks. Overall, I'm intrigued by the direction the Bucks are in. I want to be clear that I am not too happy that we traded away Jon Leuer. However, he would have been misused here in Milwaukee, and I believe he is better then what Milwaukee had in mind for him. He will excel in Houston. This draft will hopefully further my hope that this team my be close to turning itself around.